"The all conquering Greenwood Widebody Corvettes will again see action in 2016 with the scheduled debut of the first Continuation Greenwood Factory Works Widebody Corvettes. Built to the exact specifications utilizing molds and fixtures built off the original tooling, these cars will no doubt reclaim their position atop big bore podiums at the major venues in US and European Vintage racing. The debut race is scheduled to be at Road America in July. 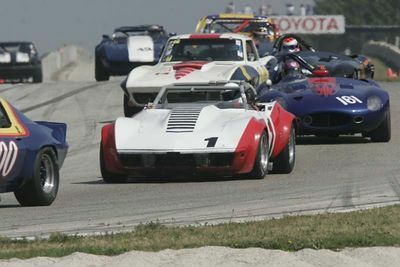 The balance of the year will have the new Greenwood cars at every SVRA race right up to and including the season ending National Championships at the Circuit of the Americas in Austin, Texas, in November." Build photos on their FB page. the widebody recreation Corvette kit car from al & ed in TX will race against current era tube frame trans-am cars and 962 Porsches, it doesn`t have a chance. That doesn't surprise me, old technology. But, thought it was interesting they were building them. Looks like they will build copies of the earlier BFG cars too. Sorry, no video on YouTube, but if you have FB, they have this vid of the Continuation Greenwood Wide body. There is another with the hood off(half way down list). Last edited by rtj; 06-06-2018 at 01:32 PM..
A real Greenwood was at the Limerock, CT Vintage races a few years back.